It was in the works for a long time, and finally last month, we were able to get the source files we needed to add in another medium resolution satellite, this time it is the 22-meter multispectral satellite Deimos-1 that we welcome to Image Hunter! When you search for a catalogue ID, if you have a polygon loaded, it will stay onscreen. Added a new feature popup. Updated ALOS image metadata to show forward, backward or nadir scan direction. Fixed a strange bug where image dates could be duplicated over and over in the results window. 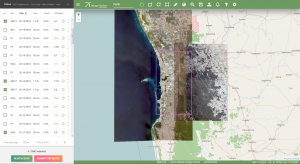 This entry was posted in The Geospatial Times and tagged Deimos-1, Image Hunter, image hunter 2, monthly spotlight, The Geospatial Times by Apollo Mapping. Bookmark the permalink.